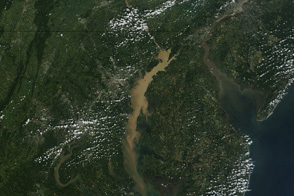 The Chesapeake Bay is the largest estuary in the United States and third largest in the world. The watershed around the Bay—that is, the area of land that drains into it—spans 64,000 square miles (166,000 square kilometers) and parts of six states. At least 150 major rivers and streams and roughly 100,000 smaller creeks, brooks, and streams pour their water into this great basin. Close to 18 million people and 3,600 species of plants and animals make their home in the Chesapeake Bay region. This sprawling watershed with nearly 12,000 miles (19,000 kilometers) of shoreline can be a challenge to see clearly by satellite. Sitting at temperate middle latitudes, hemmed in by the Appalachian Mountains and the Atlantic Ocean, there are almost always clouds somewhere over the watershed. (In fact, on any given day, between 60 to 70 percent of the planet is covered in clouds.) 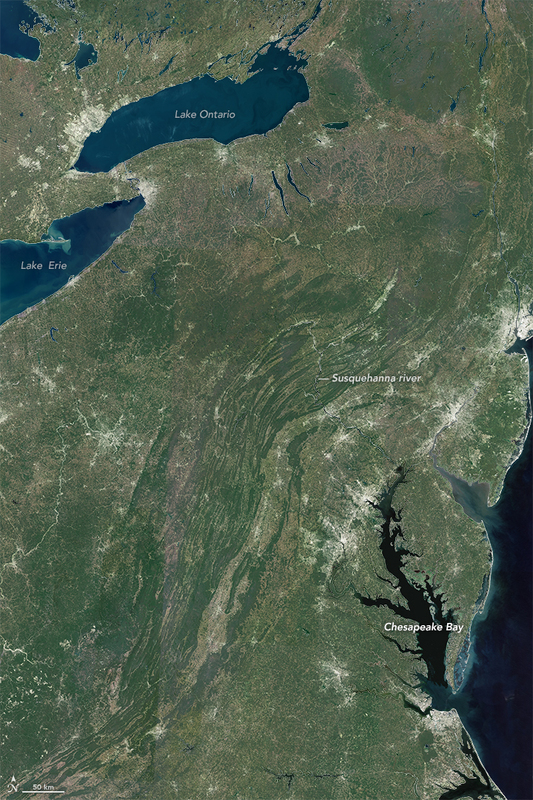 That means collecting a low-resolution image of an area the size of the Chesapeake Bay watershed is something that can happen perhaps every few weeks. 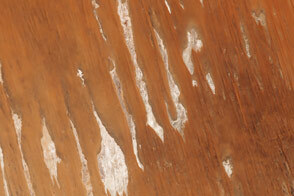 With medium- or high-resolution imagers, it can take years and requires some luck. 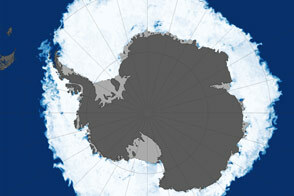 It is a scale that has served scientists well over the past four decades. With 30-meter resolution, researchers can detect and track changes in the landscape through time, whether altered by human activities or natural events. The Chesapeake Bay watershed has seen great change over the past four centuries since Europeans began settling in North America. Forests and coastal lands were remade into farmland and cities, though in recent decades, much of that farmland has been returning to forest or being converted into cities and suburbs. Along the way, researchers and advocacy groups have helped citizens better understand how lifestyle choices made far from the Bay—such as how farms are fertilized or how cities treat sewage—can affect coastal waters. Over the next few weeks, Earth Observatory will tell a series of stories about the Chesapeake Bay watershed, its natural wonders, and the relationship of human activities to the health of these historic and productive waters. 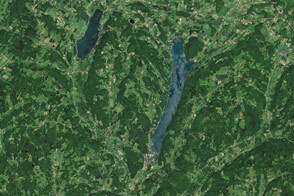 Click here to read more about the creation of this Landsat mosaic and about other efforts to make scientific data and imagery accessible and understandable for the public. NASA Earth Observatory image by Mike Taylor, using Landsat WELD data from Valeriy Kovalskyy and David Roy (South Dakota State University) and water data from Steve Foga (USGS). NASA Earth Observatory map by Joshua Stevens, using data from the Chesapeake Bay Program. Caption by Mike Carlowicz, with Ginger Butcher and Mike Taylor. It takes a lot of data and some patient, creative processing to make an image of the world’s third largest estuary system. 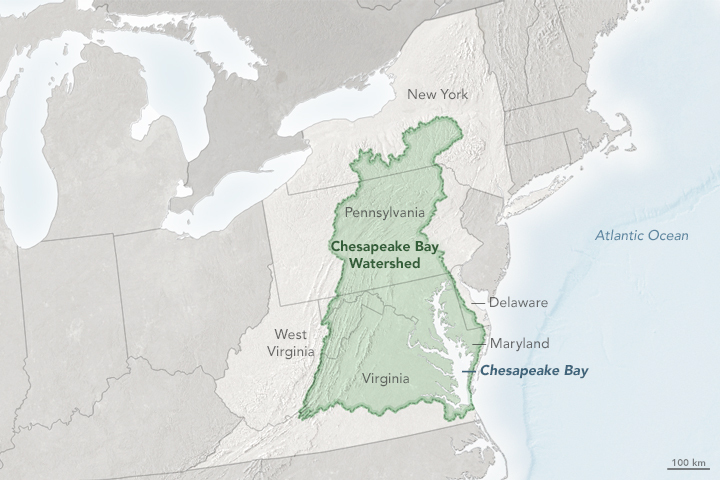 Chesapeake Bay Foundation (2015) Chesapeake Bay Watershed Geography and Facts. Accessed October 16, 2015. Chesapeake Bay Program (2015) Discover the Chesapeake. Accessed October 16, 2015. NASA (2015) Earth Science Week 2015: Visualizing Earth Systems. Accessed October 16, 2015. NASA Earth Observatory (2015, March 26) Big Data Helps Scientists Dig Deeper. NASA Earth Observatory (2012, October 1) Blackwater National Wildlife Refuge. 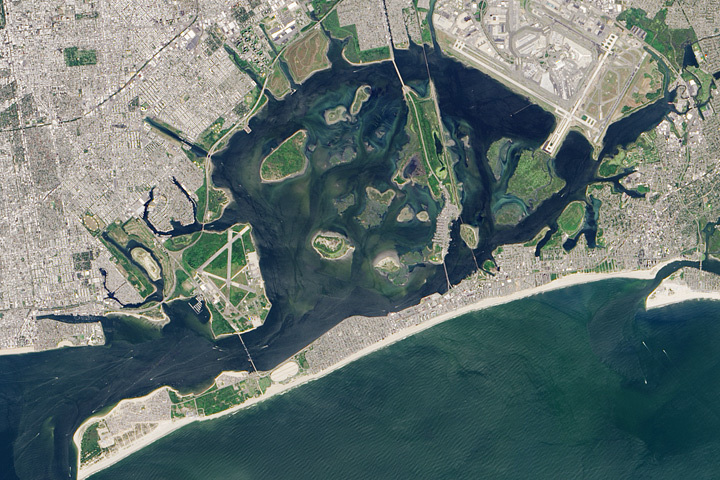 NASA Earth Observatory (2012, June 30) A Disappearing Island Restored. U.S. Geological Survey (2015) Chesapeake Bay: A Landsat 8 Surface Reflectance Mosaic. Accessed October 16, 2015.